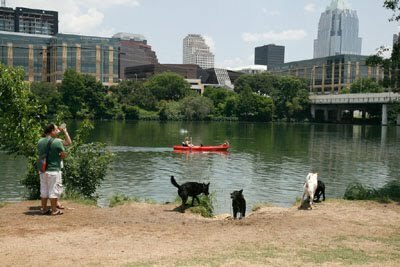 AUSTIN, Texas -- "Pet friendly" is a term you are likely to hear in some establishments, and you have definitely heard "Dog friendly" but "Cat friendly" is a term you may never hear, unless you visit Austin. It may not be blatantly posted on the front door, but most Austin businesses who allow your furry friends are welcoming to most pets, not just your "bow wow buddy". Filling two days in Austin with pet friendly places seems like a daunting task, but after a quick search on the internet, decisions become more difficult with dozens of restaurants and activities for pet owners to enjoy alongside their pets. Of course there are general guidelines that pet owners need to follow in order to allow an enjoyable time for all customers and citizens. In restaurants, there are pet seating areas on patios as long as you have a leash on your animal, or they are in a pet carrier of some sort. This not only protects other customers from privacy invasion, but also keeps your animal safe from traffic and other public dangers if your attention is diverted. There are also restrictions on certain breeds of dogs and other aggressive animals so make sure to call the restaurant beforehand if you have a concern. Some great "Pet friendly" restaurants include: Spider House just north of the UT campus, Uncle Billy's near Zilker Park, and The Snack Bar on South Congress. As for the many public parks around Austin who allow animals look for signs marking certain territory as "off-leash." Of course restrictions on "off-leash" areas include: no animals in heat allowed, clean up after animals, no aggressive breeds, and vaccinations required. On a side note, when not in these designated areas, leashes on animals may be no longer than 6 feet or the pet owner may pay up to a $500 fine. If you have been looking for a great destination for you and your pet to spend some quality time together give Austin a try. Perhaps even stop by a local quirky toy store like Toy Joy or the costume shop Lucy in Disguise with Diamonds to pick up an outfit for your favorite friend. 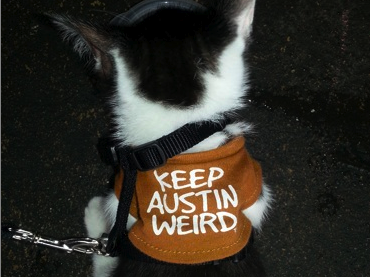 After all, while you are visiting you might as well "Keep Austin Weird."